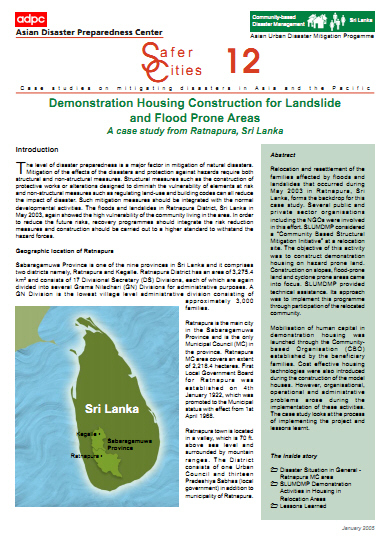 Relocation and resettlement of the families affected by floods and landslides that occurred during May 2003 in Ratnapura, Sri Lanka, forms the backdrop for this case study. Several public and private sector organisations including the NGOs were involved in this effort. SLUMDMP considered a “Community Based Structural Mitigation Initiative” at a relocation site. The objective of this activity was to construct demonstration housing on hazard prone land. Construction on slopes, flood-prone land and cyclone prone areas came into focus. SLUMDMP provided technical assistance. Its approach was to implement this programme through participation of the relocated community. Mobilisation of human capital in demonstration housing was launched through the Community-based Organisation (CBO) established by the beneficiary families. Cost effective housing technologies were also introduced during the construction of the model houses. However, organisational, operational and administrative problems arose during the implementation of these activities. The case study looks at the process of implementing the project and lessons learnt.